USA Storage is located on Route 125 in Plaistow, New Hampshire 03865, and has been serving residential and commercial storage customers since 1985. We also provide storage solutions to the residents of Hampstead, Salem, Atkinson, and Newton in New Hampshire, and West Newbury and Merrimac in Massachusetts. 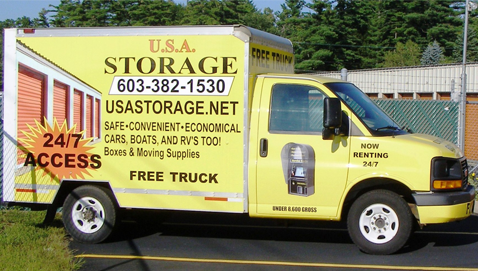 USA Storage is also proud to serve our neighbors and provide self storage for Haverhill MA. Located just 5 miles north of the town center, Haverhill residents are less than 10 minutes away from convenient and secure self storage solutions. Our facility offers professional storage solutions for household storage, business storage, vehicle storage, boat storage, camper storage, RV storage, moving supplies, moving trucks and more. The storage units at USA Storage are well maintained, and we strive to excel in customer service. We offer all of our storage customers the security, convenience and affordability they are looking for. CALL US or VISIT US TODAY to learn how we can solve your storage needs!